Leon County State Attorney Jack Campbell, who named her to the position, hopes she'll restore confidence in city government. 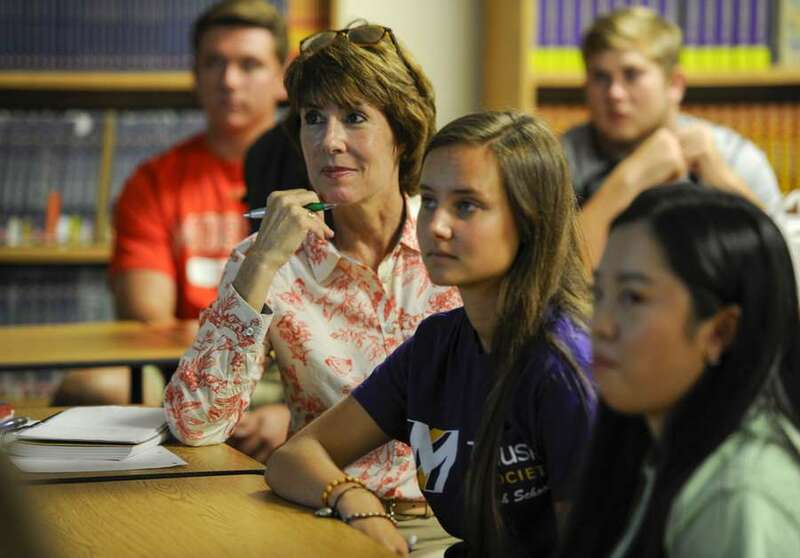 CHRIS URSO | Times Florida gubernatorial candidate Gwen Graham, top, sits with other students during an AP economics class at A. Crawford Mosley High School Monday, Aug. 21, 2017 in Lynn Haven, FL. Graham is continuing the "workday" tradition started by her father. During her day at Mosley she worked as a student and attended classes with Mosley High School senior Caroline Noble, 17. Gwen Graham has been named to a 3-year term on Tallahassee's ethics board, where the former Democratic candidate for governor will investigate complaints against city officials. Leon County State Attorney Jack Campbell named her to the board, hoping she'll restore confidence in city government just days after after one of its commissioners was indicted by federal authorities on corruption charges, according to the Tallahassee Democrat. "As an attorney, she can certainly understand where there are violations of ethical and potentially criminal statutes," Campbell told the Democrat. "And I think the citizens of this community are served when they have confidence in the city government. And it's my hope Gwen can help to restore that confidence." Graham, the daughter of former Governor and U.S. Sen. Bob Graham, was leading in most of the polls leading up to the Democratic primary before a late surge by Andrew Gillum won him the nomination. Since November, she's been busy leading Rebuild 850, a nonprofit helping the Panhandle recover from Hurricane Michael.